The 10 numbered points in the briefing paper below outline the defence risks of the Chequers Plan, which is still alive as the basis of an exit agreement. Aside from the authors of this briefing paper, many other ex-commanders of British forces, as well as politicians and the ex-head of MI6 have raised their concerns about the contents of this paper. A crucial intervention in The Times by ex-MI6 chief Sir Richard Dearlove, plus military and academic figures, pointed out how the Cabinet Office Europe Unit, headed by Oliver Robbins, had shared information about the defence negotiating position with EU diplomats before these details and their consequences had been explained to MPs. The Chequers Plan simply keeps the UK signed up to EU defence and weapons development budgets which officials conspired to force on the UK since the Brexit vote and which necessitate a wholesale adherence to EU control. The situation in October 2018 is now urgent and coming close to a crunch moment. It is essential that the completely unnecessary defence giveaways that Olly Robbins’s Europe Unit and others within government have managed to shoehorn into the negotiation proposals are erased entirely and that our future defence relationship with European partners is via NATO and nation-to-nation arrangements. The briefing below explains the full bitter story of how the UK has reached such a perilous position where we are closer to giving away political control over large parts of defence decision making to new EU structures which ministers stupidly joined after the referendum instructed them to take the UK in the opposite direction. Summary:In exchange for the trade arrangements proposed and already flatly rejected by the EU at Salzburg, the Chequers Proposals put the autonomy of Her Majesty’s Armed Forces in jeopardy and risk compromising fatally our Five Eyes Intelligence alliance and especially our bi-lateral US-UK intelligence relationship. This is a wildly disproportionate trade: to offer Crown Jewels in order not to obtain thin gruel. The EU has no business being in defence or security at all. These are either NATO or Nation-to-Nation matters. The UK should cease to discuss either matter with the EU, forthwith, and withdraw all proposals to the EU in these areas. In effect, The Withdrawal Agreement and proposed Defence Treaty would keep the UK under EU power permanently after the end of the ‘transition period’. This is not what the people voted for. 1. The text of the Chequers Proposals states that it pursues a ‘tailored partnership’ that ‘respects the sovereignty of the UK’ with the EU in defence and security as a futile inducement to gain the ‘cherry-picking’ trade aspects of the now rejected Proposals. But this carries significant direct and indirect consequences. d. and most seriously of all, compromise of our trusted status in Five Eyes should UK remain part of military GALILEO as the Government’s ‘Technical Note’ of 24 May desires. 3. It is a threat to NATO as a result both of these harms and of the opportunity cost weakening from numerous duplications and potential overlaps between EU defence structures and existing NATO functions. Such weakening has, of course, been a consistent, documented objective across the EU institutions and in certain EU capitals for many years. 4. In his “State of the Union” address in September 2017, Mr Juncker stated baldly that “By 2025 we need a fully-fledged European Defence Union.” Military EU, as developed since June 2016, is similar in form and aspiration to the unratified treaty for military union known as the Pleven Plan, that failed in 1952 and which was rejected by then British PM Winston Churchill. The major difference between the Pleven Plan and today’s Military EU is that the 1950’s version was designed to be a sub-division of NATO ultimately under NATO control; whereas today’s version asserts “decision-making autonomy from NATO”. The initiating instrument is within Article 42(2) of the Lisbon Treaty of 13 December 2007, itself an advance on Article J4(1) of the Treaty on European Union (The Maastricht Treaty) of 7 February 1992. Caveats inserted by pro-NATO member states in the second paragraph of that Clause do not provide secure legal or institutional safeguards. The comprehensive overlaps of Military EU with NATO are tabulated in Appendix 2. 5. British Ministers have allowed the EU to acquire the powers to build military EU since the EU referendum by agreeing to all steps towards Military EU in six EU Councils since the Referendum instruction to leave the EU. That consent was given on the express understanding that the UK would not participate. Then the DExEU ‘Technical Note’ on External Security of 24 May changed tack. It gave notice of intent to embrace this subordination by activating retrospectively all these arrangements by Prerogative Powers after Brexit Day. The Government Response to the Defence Select Committee report on the future security partnership with the EU, published on 22 September 2018, repeats and underlines the intention to seek real and deep engagement and further confirms the Government’s dangerous misunderstanding of how the EU actually works . Either this is disjointed strategic planning across Whitehall, or actual (but undeclared) central Cabinet Office and No 10 Europe Unit policy. Either scenario requires clarification and rectification. 6. The Chequers bolt-on route is actually worse than membership of the rapidly crystallising Military EU because it requires UK compliance with EU Defence directive and therefore associated ECJ authority, plus policy and decision-making as rule-takers without representation. It also means that the political levers attached to every aspect of UK defence will sit at the pan-EU level after Brexit Day. All this is set out in the two ruling EU documents (EDAP – European Defence Action Plan – and SDIP – Security & Defence Implementation Plan) in November 2016. 7. Therefore under this offer by the May Government, the EU will take increased control over vital UK national security matters. This is – as a matter of plain fact – the reverse of taking back sovereign control. Astonishingly, these are new areas of control over the UK which the EU did not have before June 2016 – and they are in the most fundamental of all attributes of sovereignty. 8. The Prime Minister has repeatedly stated an ambition to participate in the European Defence Fund and in the EU’s Defence Industrial Policy. The ‘Technical Note’ (confirmed in the Government Response to the Defence Select Committee) extends those ambitions to participation in EU commanded operations and eventually in aspects of PESCO (Permanent Structured Co-operation) aka Military EU: something that was explicitly denied when UK officials waved through its establishment. Meeting his German counterpart in early October 2018, Secretary of State Williamson was reported as saying that “there is so much that Britain does in terms of European defense that it is actually important to be able to plug into the European Union…and that’s something we hope to be able to get agreement on.” These ambitions carry a requirement for financial contributions and participation in joint military mission command from the EU Military Committee (via the MPCC). 9. UK participation in any aspect of Military EU brings a requirement for ‘participation’ in the European External Action Service’s Global Plan. In plain English this means accepting the primacy of the EU’s strategic foreign policy objectives as the rule-maker: objectives which, equally plainly, are diametrically at odds with those of a truly sovereign Global Britain. 10. UK subordination to Military EU structures has only recently been agreed and announced; so its implications will grow. For example, British Army soldiers deployed in Exercise ALTHEA in August 2018 wore EU flag shoulder-flashes. This denoted their participation in an EU-controlled mission with a command chain which is under the political control of the EU rather than the UK. 1. As established in analysis presented during the House of Commons Defence Select Committee Special Session on the 2017 DexEU Partnership Paper, the essential feature of the interlocking EU documents and emergent Military EU institutions is that ‘cherry-picking’ is not allowed. Participation is one part causes participation in all. Furthermore, the nature of participation allowed is not one of partnership but of subordination to the EU higher objective of ever closer union. This is established in the two foundation documents, EDAP and SDIP, and are, of course, the two one-way ratcheted dynamics in all areas of EU expansion. Therefore the UK ambition for a ‘tailored partnership’ through a negotiated ‘administrative arrangement’ is not on offer. 2. The ‘Tailored Partnership’ sought in the Chequers Proposals was first mooted as a ‘deep and special’ relationship in the September 2017 DExEU Partnership Paper. It was confirmed in Theresa May’s Munich speech of February 2018 and then stated in detail by Alastair Brockbank, the Defence Adviser to Oliver Robbins, the PM’s principal Brexit civil servant, secretly recorded in the ‘Kit Kat Tapes.’ These tapes show an intent to extend UK affiliation to the EU’s Common Defence process. Brockbank’s extraordinary ultra vires comments are transcribed in Appendix 1. After publication it was conspicuous that he was neither sacked nor, it appears, disciplined. In fact his ambitions and in some cases forms of wording were formally set out in the ‘Technical Note’ on External Security of 24 May 2018. 3. In Articles 6 and 14 we find ambitions to share intelligence and analysis. That could imperil our real defence alliance through Five Eyes and the USA. This would be a threat to national security. Instead, we should break out of Galileo, in which we are the dominant force, and build our own satellites to add robustness and redundancy to Global GPS and to provide specific UK niche intelligence capabilities available to Five Eyes. The Secretary of State Gavin Williamson was totally correct in reported remarks on October 1 2018 that “all capabilities for Galileo don’t sit with France, don’t sit in Germany and various other countries: they sit in Britain. The only country that can make something like this work is Britain and the question they [the EU] have to ask is, can they do it without us? I would say no. Can we do it without them? I would say yes”. He should not regret the EU attempt to shut Britain out. He should, as the relevant Minister, champion and drive an independent British system, as Sir Richard Dearlove and Professor Gwythian Prins strongly recommended in May. It is therefore reassuring to learn that concrete plans and funding for a UK national satellite system are ear-marked and that EU access to UK overseas ground stations may be denied. This is the essential first and best step to breaking out of the entire cat’s cradle of Military EU. 4. The stakes could not be higher. If the UK stays inside Galileo, it risks losing our position within Five Eyes and with the USA. A realistic reading of the conduct of Mr Selmayr, a committed federalist and not a noted anglophile, is that the Commission seeks to exploit UK leads in intellectual property in satellite technology and secure data manipulation, based on EU corporate interests and notwithstanding incidental damage to the UK’s. The UK’s relationship with its Anglophone Five Eyes partners and especially the USA is not a known Commission concern. 5. The actions of British civil servants display a pattern which seems to be blind to these risks because they are pursuing a deep and multi-faceted subordination within Military EU. In Article 17 we find ambitions to lock us into subordination with the EU Political and Security Committee and EU Military Committee. Precisely as Brockbank said in the Kit Kat tapes, there, in Article 17 (f), we find the ambition for ‘secondments to the EU Foreign Service’. In 17 (h) (i) ‘UK participation in the EU Operational HQ’. PESCO is a centrepiece of the EU’s Common Security and Defence Policy, so a country that wants to contribute to PESCO projects would logically also have to be ready to support that Common Security and Defence Policy. So far there is nothing more than what is stated there and also on the Brexit and this can be it more or less and there’s no arguing about any flexibility or whatever you mean. So this regulations as they are in place, that’s what it is, what you have to keep in mind. 7. However it is correct that the nature of the UK’s future relationship with the EU over procurement is a national security priority. But ‘Third Party’ participation on Norway (or closer) terms, as pursued by civil servants and ministers, is a threat to sovereignty because it is structurally prescribed as a level of dependent partnership: not an association of equals. The UK negotiating objective should be formally to leave the EDA as a full member but instead simply reach an agreement that posts a couple of UK staff as liaison officers (in effect, observers) within it to identify potential areas of procurement at a very early stage. UK would defend its sovereignty if it insisted on military research and procurement being conducted through the OCCAR, which is quite separate from the EU, rather than through the European Defence Fund as the Prime Minister and her advisers repeatedly are seeking. Already today, multilateral work does shift from the EDA to OCCAR, and primary focus should now be being placed on streamlining this process for initial procurement planning post-Brexit. By remaining in the new European Defence Fund, the UK would be obliged to remain in participation criteria, including financial contributions. 8. Article 25 of the “Technical Note on External Security” additionally states that the UK is already signing up to participation: ‘We should not wait where we do not need to. The UK welcomes the agreement that future arrangements on CSFP and CSDP could become effective during the Implementation Period.’ This is precisely what was said in the Kit Kat Tapes – and it would effectively mean that any time from now, the Government could permanently lock us under EU control in Defence and Security by Prerogative Powers. 9. The Chequers Proposals imply that these above are extra inducements offered to the EU whereas they are, in fact, inflexible pre-requisites of participation stated in the EU Commission’s third-country participation rules. The Chequers Proposals takes the UK further into ‘military EU’ than we were in 2016. It is the perverse and precise opposite of Leaving. • Given information after commitment was given instead of before, in breach of parliamentary protocol. • Told that the commitments didn’t matter to the UK. • Given incomplete information about the commitments. • Told that parliamentary committees would have a chance to assess and give conclusions when commitments had in fact already been concluded by UK Government. • Told that the EU’s new military structures would be beneficial to the UK and UK defence industry, without explanation about the full policy commitment and consequential democratic loss. • Told that UK participation in structures is up for negotiation when it wasn’t. UK participation was already being concluded and could not be renegotiated retrospectively. Also, the EU Commission had already concluded participation criteria for third countries which currently already apply to Norway. • Given no chance to debate the topic on floor of the House of Commons. • Given no opportunity to vote on the topic at any stage of approval of UK participation concluded by UK ministers at EU Council. They have been seven such instances since the EU’s new military ambitions were announced five days after the Brexit vote. • Motivated to refer the topic for discussion by other committees – which did not happen. Since the resignation of DExEU ministers David Davis and Steve Baker, we now know those Ministers were unaware of the policy commitment associated with UK participation in Military EU. No doubt staff in government departments have been similarly unaware. A small number of senior staff mainly in the Foreign Office and the Ministry of Defence have been responsible for steering UK participation in Military EU. When given the chance, these staff have failed to explain the full policy commitment required by the UK and the associated democratic loss. The inescapable implication of this is that certain officials, with the knowledge of certain Ministers, have been actively pursuing ‘under the radar’ a policy of binding the UK into and under the emergent Military EU after Brexit Day. The Cabinet Office has proposed a Defence Treaty between the United Kingdom and EU Commission, comprising, along with Security, two of the ‘Four Pillars’ of the Barnier post-Brexit model (viz (1) effective exchange of information (2) operational cooperation between law enforcement authorities (3) judicial cooperation in criminal matters (4) measures against money laundering and terrorist financing). This treaty would replace the Lisbon Treaty as the document providing a legal underpinning to UK involvement in Military EU (which is the real meaning of Mr Juncker’s “State of the Union 2017” ambition for common defence). • This was first proposed to the EU where it was referred to as a Framework Partnership Agreement. That is a significant and dangerous template because it shows that the EU wishes to take control of these most fundamental attributes of the security of the UK on the model of other binding treaties that the EU has entered with third countries with regard to trade, fisheries and defence. • During the transition phase, the UK would be temporarily committed to the EU’s common defence policy, EU defence procurement directive and the entire EU acquis. This gives the Cabinet Office time to create a defence treaty which replaces the Lisbon Treaty as the UK’s long-term commitment to the EU defence acquis. • According to the Cabinet Office, this treaty is earmarked for conclusion during the transition period from 30 March 2019 to 30 December 2020. However, Cabinet Office has indicated that they would aim for an ‘early’ conclusion of the agreement. MPs seriously risk not being fully engaged in this process because a treaty concluded after the UK has officially left the EU on 29 March 2019 will unambiguously be an international treaty and not a supranational one governed by the UK’s participation in the EU – the vexed argument over the status of the Lisbon Treaty that led to the Miller Case and thereafter the Article 50 vote in Parliament. International treaties can, of course, be concluded with prerogative powers by ministers alone. No ratification by Parliament is required as the Technical Note of 24 May 2018, Para 25 made plain. This is Brockbank’s full statement at the LSE conference, made available in breach of the ‘Chatham House Rule’ as a matter of overriding public interest with thanks to Harry Cole, then the Lobby Correspondent of The Sun newspaper. First on the kind of the legal ramifications and the implementation period has been the key thing keeping myself and colleagues very busy the past fortnight. What is in the EU text is that and it’s the only phase within the text is that there is a future agreement on CFSP and CSDP that could be agreed during the implementation period. So, unlike JHA and other areas where we would wait until 2021, we can bring this in at any point during the implementation period. Now, the question is the word ‘during’ uh which infers that before it does come in, what happens to the UK, do you follow CFSP title 5 chapter 2 of TEU, or do you fall out of that. Um… and honestly speaking and off the record this has been for us some quite difficult political conversations for us in the UK. Where we think things should be is that… and similar to what the EU has put out in their future guidelines is that there should be no gap on CFSP and CSDP. So as you rightly said if we were to fall out, that is when for example a mandate renewal comes up in a CSDP operation, we could fall out of that operation and we would no longer be party to the family decision of the European Defence Agency. So it’s in both our interests that there’s agreement between exit day this implementation period and before any future agreement comes in. However, what we’re seeking is for that future agreement to come in as soon as possible and it makes things quite difficult as you know, there will be this future agreement and there will be this declaration around October when they’re going to the European Parliament. VFB COMMENT: These opening 7 paragraphs seek to keep the UK in the EU’s foreign policy and policy regulatory landscape (CFSP) and EU defence policy (CSDP) so that there is “no gap”. At the time these remarks were made, ministers had given no indication of this policy to Parliament. It is incumbent on ministers to explain why this policy had not been communicated to Parliament if Brockbank was acting under ministerial instruction. ‘No gap’ means the UK remaining subject to EU rulemaking as far as foreign and defence policy were concerned. Note that these comments were being made in front of an audience composed of diplomats from other EU states. But what will happen is that because we are seeking this future agreement during the IP, we are negotiating the detail of that at the same time as we are discussing the political high level fluffy bits that will go into any declaration that gets made public. So there are some kind of handling issues around there, but I just wanted to stress that where we are at the moment between UK and Taskforce 50 is that we are not falling out of CSDP on exit day and we still have this mutual intent to bring a mutual agreement into effect as soon as possible in the implementation period. So just to get that out of the way first. Then more generally listening to what’s been said in the room. When we sat down and were thinking about the Prime Minister’s Munich speech it was kind of framed and exactly as our French colleague said Europe will have to do more. We recognise there are some strategic shifts in the world, we still have Russia as a major threat in the East, there’s kind of cyber on the horizon, but also kind of preppy uncertainty around where the US are heading with regard to European security. So when we sat down and were thinking ‘therefore what should our message be?’, we knew that going into Munich other countries would come with a pro-European / anti-US message, that actually It’s about all the partnerships you have that you need to leverage. So that includes NATO, it includes bilateral partnerships, the UK-France summit recently. It Includes small groups, Five Eyes our key five membership, Northern Group as our Dutch colleague said, Joint Expeditionary Force and things like the European Intervention Initiative which the UK would like to be a part of. VfB COMMENT: Brockbank is indicating to EU diplomats that he was a part of the team which “sat down and were thinking about the Prime Minister’s Munich Speech” and “we sat down and were thinking ‘therefore thinking what should our message be?’” He is indicating that he was involved in the team which decided the Prime Minister’s messaging. And then kind of fourthly, the elephant in the room is our partnership with the EU um and the Prime Minister’s speech, the simple message beyond ‘Europe’s security is our security’ and ‘unconditional commitment’ which you’ll have heard peddled by ministers countless times before, Is that ultimately we want something that will give us the best effect, where the UK and EU can work side by side and not be constrained by dogma, rigid institutions and frankly not let some of the ideology get in the way. Now, we recognise that what we are asking for is beyond what existing third countries have and will be extremely difficult for EU member states to agree, but this is something which we want to at least entertain and force consideration of. Now as I said there is mutual interest, both in the implementation period to bring things forward as soon as possible, the future guidelines to have no gap. VfB COMMENT: Brockbank says that there is mutual interest to “bring things forward as soon as possible” and for the “future guidelines to have no gap”. At the time of this speech there had been no indication from ministers that HM Government would seek (a) a continuation of CFSP and CSDP,( b) that it should have no gap or (c) that an agreement on any of these matters should be brought in as soon as possible. Parliament and the public were (and are) completely in the dark while this individual was sharing fundamental matters of Cabinet Office – and therefore the Prime Minister’s proposed policy -with diplomats from counterparts in the negotiations. This conduct pre-figures the Prime Minister’s own improper conduct by briefing Merkel, Rutte et al before her Cabinet, prompting the resignation of three Ministers. And there’s not as big a gap between slides put out by Taskforce 50 and kind of speeches by the Prime Minister and others as there are on most other areas of Brexit. So we are confident that this is somewhere that we can reach an agreement and one that is broadly positive. When… If we are looking specifically at CSDP and looking through the three categories, we look at operations and missions first. Now, the existing third countries with Framework Partnership Agreements – unless you are Switzerland who do them on a mission-by-mission basis and smuggle some dodgy terms into some of the financing bits – those agreements there’s… you have your decision to establish and decision to launch a mission. VfB COMMENT: The comment about Framework Partnership Agreement is especially dangerous because it takes UK subjugation to EU policy even further. At this point in February 2018, there had been no indication from ministers that they were seeking a Framework Partnership Agreement with the EU on defence and CSDP. A Framework Partnership Agreement is the EU nomenclature for a binding agreement between the EU and a third country, conditional to the third country’s observation of EU rules. This is the first time that a Government official is recorded as advocating a binding future commitment to EU defence policy and structures and the EU rulebook in defence. Ministers had not indicated any such policy to Parliament. No such policy had been discussed or subjected to scrutiny as is the requirement for all policy related to the EU relationship. It is incumbent on ministers to prove that Brockbank was acting under instructions in all these matters and if he was, why did the relevant minister not communicate these instructions and intentions to MPs? If he and his boss Robbins were acting without Ministerial instruction why have they not yet been sacked? What the UK… the position we’re coming from is that where we make a significant contribution to one of these operations, there should be some assurance and consultation prior to this decision to launch, between establishing and the decision to launch so the mandate shouldn’t say it’s been agreed and ‘by the way guys would you like to come along’. If there is some kind of mutual development and some kind of consultation between establishing and launching a mission, then it’s far more likely you would get a demonstrable commitment from the UK. Now, likewise for existing missions that might be amended or changed when things come up like strategic reviews, knowing that this mission is still in our interests, that things like Operation Sofia won’t be broadening its mandate or narrowing its mandate, but kind of stays in our interests, then we would also like to see some consultation there and we don’t think that is unreasonable. I should also add that there’s lots of talk about protecting the decision-making autonomy of the union. I don’t, I think… honestly speaking… it would be completely unnegotiable for us to keep a seat at the PSC, EUMC and all the rest of it, we know where to draw the line. VfB COMMENT: Brockbank is acknowledging that the Framework Partnership Agreement he is advocating would mean the UK subscribes as a ruletaker with no guarantees for decision-making input. The CSDP-third country relationship discussed here appears similar to that of Norway. However, he is making a supplicant case for a UK role in decision-making outside of the formal decision-making structures. So we are looking in the space of the decision-shaping, consultation, the information-sharing, the analysis and, like other people have said, secondees are so important for having both our people in Brussels but also having European External Action Service possibly in UK ministries to facilitate that exchange is something we are very interested in exploring. VfB COMMENT: This statement is beyond extraordinary. At this point (nor yet) has there been any such indication from ministers that the UK would be seeking to implant EEAS officials within UK Government departments after exiting the EU. It is incumbent on ministers to prove, as with the rest, that Brockbank received this refutation of ‘taking back control’ as a direct instruction from ministers and if he did why it was not communicated to MPs for discussion in Parliament. Atalanta, our position is… and the withdrawal text is that we cannot command whatsoever in the implementation period. Our position is actually if you want us to, we are open to consideration of that if it is for the sake of continuity. There’s talk of possible relocation from Northwood for Atalanta, but there is kind of no firm shutting of door from the UK. If the door gets shut it will be from the Commission side. VfB COMMENT: Ministers had not communicated to MPs that the UK would be seeking ‘continuity’ in the UK application of EU defence policy or that the UK would seek a leading role in the application of EU defence policy at UK taxpayers’ expense. Parliament at this stage had not been given to believe – nor has yet – that the UK’s exit from the EU would mean its continuing subordination to the EU defence acquis. Althea is a different issue which some of you will know is commanded by a UK officer in NATO, DSACEUR. That ultimately it is not a decision for us to make, that is a bilateral decision between the EU and NATO, he is a NATO officer, he just so happens to be British, he is not a British officer. EU Battlegroup someone touched on, I think the 2nd half of 2019 we are on the roster to be on the EU Battlegroup. Um, obviously with this future agreement possibly coming in at some point during the implementation period we don’t really know if we’ll be coming or going or what our status will be at that stage, so we think it makes sense to notify that we will back off from that slot, but keep an option to kind of participate in the EU Battlegroups in the future, but the terms and precise arrangements for that will need to be discussed in more detail in the future. VfB COMMENT: Ministers had given no indication of this policy to Parliament. It is incumbent on ministers to explain why this policy had not been communicated to Parliament if Brockbank was acting under ministerial instruction. So that’s kind of broadly the operations and missions stuff. When it comes to the European Defence Fund, EDRP which will come in in the next MFF (EU budget Multiannual Financial Framework) and EDIDP on the capabilities side, um, we are interested in it all. And the EDA they have precedents for admin arrangements with third countries Switzerland, Serbia, Ukraine I think and we see a similar model working for us and that’s not somewhere I think that will cause a massive fight. Where things I think get more difficult is the European Defence Fund and with negotiations ongoing, how through ongoing business can ourselves and others ensure that arrangements for third countries to dock into the European Defence Fund are adequate and don’t kind of turn people off the idea of participating. There’s this nervousness against the US, there’s this idea that Europe wants to be more competitive. It would be very difficult for Europe to compete against the US and for Europe to be genuinely competitive if you were to say ‘no thank-you’ and shut the door to one of the biggest defence industrial actors in Europe. So I think having to look for a partnership for EDF would work for both sides. VfB COMMENT: Here, the speaker is advocating for the idea of ‘Europe’ ‘competing against the US’ in defence industrial contexts and that the EU should avoid ‘shutting the door’ on the UK for that specific purpose. The idea that the UK is aiming to join an industrial battle against its US ally as a bargaining incentive for the EU will be a surprise and disappointment for MPs and a shock to our US allies, as was confirmed during VfB briefing of these matters on Capitol Hill on 12 October 2018. It is incumbent upon ministers to state whether they agree with this tactic and if they do not why to explain why such a statement was ever made? The other point that often doesn’t get discussed is Britain as both a market and a salesman ultimately. If it is quite narrow permission for third countries to participate, would it be easy to sell that kit elsewhere, would it just be Europeans to make that kit, Europeans to use, Europeans to buy, or would you be looking to make that kit that you developed an export success, that an area where the UK could have particular success in the European Defence Fund. Then all the bits around the side, PESCO obviously we are not a participating member but want third country arrangements to be as flexible as possible and we want to demonstrate our intent and show that we’ll be a serious partner for capability projects we are interested in, and as kind of the different tranches come round we would see what we can contribute towards PESCO still. VfB COMMENT: In reference to the interlinking European Defence Fund and PESCO above, at this stage the fundamental participation criteria for both structures were already known. 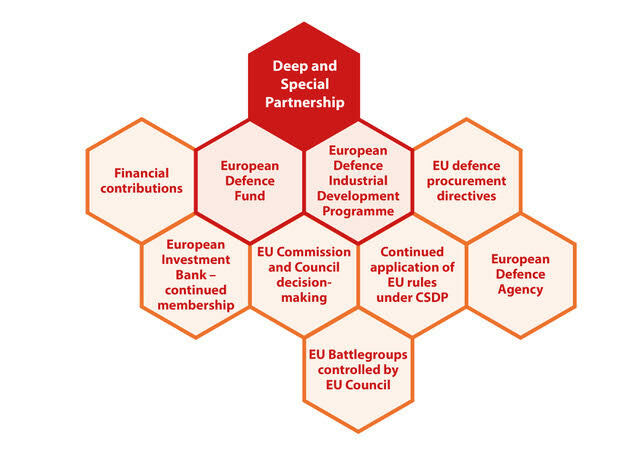 The European Defence Fund is specific to EU territory which for purposes of the EU guidelines included Norway, adherent as it is to CSDP, EU defence directives, European Defence Agency membership and financial contributions via the EEA agreement. In the letter of EU law, it is factually incorrect to imply that either EDF and PESCO could be made so flexible that there would be a diminished policy commitment for the UK which would be compatible with the full level of UK authority over defence mandated by the people’s instruction to government to exit the EU. The EU has a level of inflexible certainty over its participation criteria which is not being reflected by the speaker’s statement. CARD is the other thing where we are not sure, we are participating in the future round of the Coordinated Annual Review on Defence… this is all getting a bit technical… We are participating in it at the moment and again we are not entirely certain of where it will go in terms of EDA governance, EDIDP and all the rest of it… the acronym soup all gets a bit messy. But we still retain an interest in CARD if it does help us deliver the best effects and the best capability for Europe to meet its threats. VfB COMMENT: Ministers had given no indication of this policy to Parliament. It is incumbent on ministers to explain why this policy had not been communicated to Parliament if Brockbank was acting under ministerial instruction. If a minister had advocated future UK participation in CARD, that minister would need to account to Parliament over why significant influence over defence spending was anticipated to be handed directly to the EU after exit. This is what CARD does – it is an incentive scheme for allowing the EU to coordinate defence spending according its own priorities. Member states are given financial incentives to apply the defence spending ‘guidance’ that the EU provides. The other bit, which gets missed at the minute is space which is in an odd position in the legal space, but the place that Space has in European defence is quite major. So Galileo is the EU’s version of GPS and the secure signal of Galileo will be crucial for military and emergency services in the future. Now, in both implementation period talks and some of the ongoing business there is difficulty between the UK and some of the member states in terms of our exclusion from secure aspects of that project. That makes it quite difficult for us, because if we are excluded from secure aspects, we have critical dependence then on GPS. However, ultimately Galileo doesn’t deliver for us what we need it to, it doesn’t give us a sovereign alternative should the US kind of turn off the switch. On the commercial side roughly 80% of Galileo have secure elements and the majority of those are going to the UK. This for some member states will be seen as ‘fantastic we can sense a lot of euros in the air here’. The downside is that a lot of the competence for secure areas of Galileo sits within the UK. So the UK’s exclusion can delay the delivery of Galileo by two, three years, it can make it a lot more expensive and it also means that you have been a little bit frosty towards a country that could develop something of their own. VFB COMMENT: The speaker says *he thinks* Galileo will be crucial for the UK-EU partnership in future. Does this mirror ministerial judgement or is it his own opinion? Full UK participation in Galileo is contingent on UK adherence to EU defence policy, owing to the UK’s involvement in EU Council agreements which permitted Galileo and Copernicus to be accepted into the EU’s defence acquis. As Brockbank acknowledges, “the place that Space has in European defence is quite major”. Did ministers know that UK inclusion in Galileo’s secure contracts after Brexit was dependent on UK adherence to EU defence policy with continent risk to the Five Eyes Intelligence Alliance (as Sir Richard Dearlove and Professor Gwythian Prins have explained in other joint work)? If so, why did ministers not communicate this to Parliament? Was Brockbank acting under ministerial instruction when he made these statements to representatives of the member states of the EU Council: the UK’s counterparts in the negotiations? It is incumbent on ministers to explain why this policy had not been communicated to Parliament if Brockbank was acting under ministerial instruction. Veterans for Britain was formed in March 2016 by a group of retired senior officers in order to put forward the Defence and Security arguments for the UK to leave the European Union in the June 23 Referendum, and to provide a voice for the UK’s military veterans and serving soldiers in the Leave campaign. VfB is chaired by a retired Royal Marine, Major General Julian Thompson, who commanded 3 Cdo Bde landing under attack at San Carlos Water, which opened the liberation of the Falkland Islands in 1982. All military members of VfB’s Board have had fighting careers in the Queen’s Service. SUPPORT Her Majesty’s Government in the task of restoring full sovereign control to all aspects of the defence of the Realm in accordance with the Referendum Mandate of the people to take back control of our country. INFORM the General Public by all appropriate media channels of the Organisation’s views under the above three headings. Veterans for Britain made a major impact in the EU Referendum. It neutralised successfully the Remain campaign’s attempts in Project Fear to use security scare stories to their advantage. We gained thousands of supporters and widespread media coverage following the intervention of 14 Admirals and Generals advocating a vote to Leave. We held public meetings and mobilised hundreds of activists to deliver 250,000 Veterans for Britain leaflets in ports and garrison towns across the country. Veterans for Britain argued that the UK’s role in NATO and Five Eyes was and is the cornerstone of the country’s international defence cooperation and that it was NATO that had maintained peace for the UK and Europe, not the EU. We rejected completely the notion that departing from the European Union would have a negative effect on the UK’s defence and security. The opposite is the case. Faced now with the evidence in the following paper, VfB is fully engaged, most especially under its Third Mission, in combatting stealth plans, some emanating shamefully from within the Government, to keep the UK tied to and subordinate to Military EU.